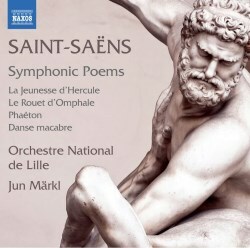 Jun Märkl’s new Saint-Saëns orchestral collection gives us splendid modern versions of the composer’s four symphonic poems, all composed in the 1870s. No.3 in the set, Danse Macabre, is a popular pot-boiler but the others are somewhat less well known. Berlioz and Franck both wrote symphonic poems but it is Saint-Saëns who has been largely credited with introducing the genre to France. It was a strange editorial decision on the part of Naxos not to have the 4 symphonic poems appearing on the CD in sequence, as I have done in my list of contents above. Instead the disc opens with Phaéton and finishes with Danse Macabre. All the music presented here is fairly typical of Saint-Saëns. It’s all tuneful, charming and beautifully orchestrated. Even in the heavily scored passages it is a joy to listen to. The orchestration still maintains its transparency and never becomes bombastic and thick textured in the tradition of the symphonic poems of Liszt or, for that matter, César Franck’s. Le Rouet d’Omphale (Omphale’s spinning wheel) is a cleverly constructed piece with its opening pages depicting a spinning wheel to perfection. The music depicts the story of Hercules serving as slave to the Lydian queen, and operating her spinning wheel dressed in female attire. There is a central sombre episode but on the whole this is a light and airy piece. Phaéton has for its story the legend of Helios’ son who, having obtained permission to drive the sun chariot, approached so near to the earth that the sun and the chariot were only saved from destruction by Zeus. The music is more powerful and dramatic than Le Rouet d’Omphale and Saint-Saëns imaginatively conjures up the galloping horses with an insistent opening motif, not a million miles away from Night Ride and Sunrise by Sibelius. There is little to say about Danse Macabre. The composer’s depiction of Death appearing on Halloween and summoning the dead from their graves while he plays his fiddle is a well-established concert piece and rightly so. La Jeunesse d’Hercule (The Youth of Hercules) is based on another fable relating to Hercules who, on his entrance to life, saw two roads lying open before him - one of pleasure and one of virtue. This is the longest and most substantial work of the set and more Lisztian in its structure and approach. The lyrical string melody at the opening gives way to a short but manic and stirring bacchanal. The lyrical opening theme returns and there ensues a fight between this music (virtue) and the bacchanal (pleasure). Virtue wins the day in a stirring climax. The pieces that complete the programme are three more examples of the composer’s ability to write good tunes and score them with true craftsmanship. The performances from the Lille orchestra have a light Gallic touch about them and Märkl avoids burdening the music with thick textures and heaviness even in forte passages. That is fine judgement on his part. This is elegant music making. I have heard more edgy and demonic performances of Danse Macabre but in fairness, the conductor’s approach to the piece fits in perfectly with the other three symphonic poems. The Naxos recording is first rate. This is highly recommended despite the rather short playing time by the label’s usual standards.